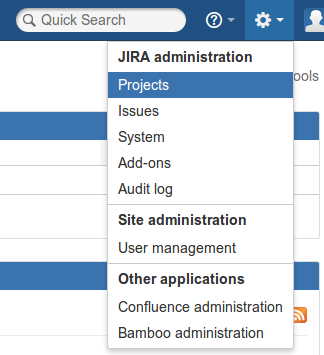 If your instance has been upgraded to the new centralized user management experience, you'll notice some minor changes to the administration menu in JIRA (available via the cog icon). All the existing items are still there, but it's now easier to find what you need at a glance. If you also administer Confluence and/or Bamboo in OnDemand, you'll notice that all of the administration menus now have a similar layout. The Development panel in a JIRA issue lets you see information from your development tools directly in your JIRA issues. These tools can include Stash, FishEye, Crucible and Bamboo, as well as GitHub and GitHub Enterprise. The Development panel now replaces the Source, Reviews and Builds tabs, as well as the Deployment panel, when the connected applications are of a supported version, and when the application links are suitably configured. Previously, development tool information would appear in both locations. Note that for older application versions, or when the applinks haven't been updated, the Source, Reviews and Builds tabs, as well as the Deployment panel, will continue to be displayed. Furthermore, we've fixed an issue that prevented GitHub pull request information from being displayed in the Development panel. Read more at Streamlining your development with JIRA OnDemand, in particular for information about supported versions and how application links need to be configured.